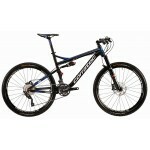 RámOpiate 650b Alu, Corratec VPS systemVidliceRockshox Pike 650b, RCT3, 15QR, 150mm, TaperedTlumičRockShox Monarch Plus RC3PřehazovačkaSram XO 11 SpeedPřesmykač-Řazeníram XO 11 SpeedBrzdyAvid Elixir 9 Trail CarbonKlikySram X0 11 Speed, 32 z.KazetaSram X0 11, 10-42ŘetězSram XXZapletená kolaZZYZX 650b SL AlloyPláštěContinental Mountain King 650b, 2.4 FoldingSedloCorratec MTB Saddle, Cr-Mo Rails, MicrofiberSedlovkaRockShox Reverb 125mm, 31.6x380mmPředstavecZZYZX 1.5 StemŘídítkaZZYZX MTB 25mm rise, ..
RámOpiate 650b Alu, Corratec VPS systemVidliceRockshox Pike 650b, RC, 15QR, 150mm, TaperedTlumičRockshox Monarch Plus RPřehazovačkaShimano XT M786 Shadow PlusPřesmykačShimano XT M781ADŘazeníShimano XT M780BrzdyShimano M615 DiscKlikyShimano SLX M672, 40-30-22KazetaShimano SLX HG81, 11-36ŘetězShimano HG-54Zapletená kolaZZYZX 650b AM AluPláštěContinental Mountain King 650b, 2.4 FoldingSedloCorratec MTB SaddleSedlovkaKindshock Dropzone 125, 31.6x385mmPředstavecZZYZX 1.5 Stem, 31.8mmŘídítkaZZYZX MTB ..
Rám2CIRCLE Suspension, 100mm Travel, Alu 7005Vidlice DT Swiss 650b Mag XMM 100mmTlumič DT Swiss M212PřehazovačkaShimano XT M781PřesmykačShimano XT M780ŘazeníShimano XT M780BrzdyShimano M615 DiscKlikyShimano XT M782, 40-30-22KazetaShimano 10 speed, 11-36ŘetězShimano HG-54Zapletená kolaZZYZX 650b SL Alloy, QRPláštěContinental X King 650b x 2.2 FoldingSedloCorratec MTB Saddle, Cr-Mo Rails, MicrofiberSedlovkaZZYZX SL 6 Series, 31.6x350mmPředstavecZZYZX 6 Series OS, 31.8mmŘídítkaZZYZX MTB 15mm rise, ..
Mountain XC Travel F:140mm R:135mm Weight 13.2kg The Slider platform is a high performance alloy trail machine that features 140mm front- and 135mm rear suspension travel for aggressive riding. 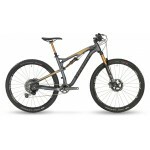 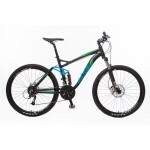 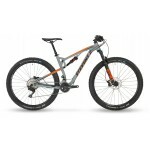 IDS Revo suspension technology is used on this mountain bike model, resulting in a stiff and predictable suspension feel with great pedalling stability. 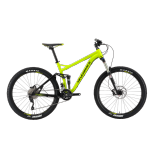 The 275 size wheel with large volume tyres works perfectly for aggressive trail riding..
Mountain Trail Travel F:140mm R:135mm Weight 13.46kg The Slider platform is a high performance alloy trail machine that features 140mm front- and 135mm rear suspension travel for aggressive riding. 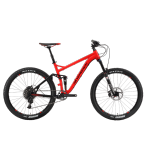 IDS Revo suspension technology is used on this mountain bike model, resulting in a stiff and predictable suspension feel with great pedalling stability. The 275 size wheel with large volume tyres works perfectly for aggressive trail ri..
Mountain Trail Travel F:120mm R:110mm Weight 14,75kg The Synergy range with its 1/3 Concept creates a highly adaptable platform to enable the carbon front triangle full suspension trail bike to cover the three wheel options of Slim (29” with 2.2” tyres), Slimfat (27.5” with 3” tyres), and Fat (26” with 4” tyres) by using different rear triangles. 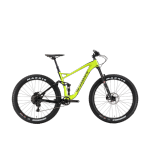 This trail frame has great strength, stiffness, durability and low weight as its cor..
Frame Aluminium 7005 TBPřední vidlice Fox 34 Float PerformanceHlavové složení STEVENS MTB Taper 1 1/8"-1 1/2"Odpružená zadní vidlice Fox Float DPS PerformanceBrzdy Shimano Deore XTKliky Shimano Deore XTPřesmykač Shimano Deore XTŘetěz Shimano CN-HG701Přehazovačka Shimano Deore XT Shadow+Kazeta Shimano Deore XTGear ratio 1.44 - 7.23 m, 2*11Zapletená kola DT Swiss M 1700 Spline TwoPneumatiky Schwalbe Nobby Nic EvolutionŘidítka Spank Oozy TrailPředstavec Spank Oozy TrailSedlo Oxygen RocciaSedl..
CHASSIS Frame Aluminium SL 7005 DB Axle: QR12x148 Brake: postmount disc 7" BB: Pressfit BB92 Front derailleur mount: Direct mount (high) Cable routing: internal Přední vidlice Fox 32 Float Rhythm Travel: 120 mm Air suspension Tapered Steerer 1 1/8" - 1 1/2" Axle: QR15x110 Brake: postmount disc 6" ..
CHASSIS Frame Carbon SL HMF Axle: QR12x148 Brake: postmount disc 7" BB: Pressfit BB92 Front derailleur mount: Direct mount (high) Cable routing: internal Přední vidlice Fox 34 Float SC Performance Travel: 120 mm Air suspension Remote Lockout Tapered Steerer 1 1/8" - 1 1/2" Axle: QR15x110 ..
CHASSIS Frame Carbon SL HMF Axle: QR12x148 Brake: postmount disc 7" BB: Pressfit BB92 Front derailleur mount: Direct mount (high) Cable routing: internal Přední vidlice Fox 34 Float SC Factory Travel: 120 mm Air suspension Remote Lockout Kashima coating Tapered Steerer 1 1/8" - 1 1/2" ..
CHASSIS Frame Aluminium SL 7005 DB Axle: QR12x148 Brake: postmount disc 7" BB: Pressfit BB92 Front derailleur mount: Direct mount (high) Cable routing: internal Přední vidlice Fox 32 Float Performance Travel: 120 mm Air suspension Remote Lockout Tapered Steerer 1 1/8" - 1 1/2" Axle: QR15x110 (29") |..
RámAluminium 7005 TBVidliceFox 34 Talas Evolution CTD FIT Remote Tapered.QR 15TlumičFox Float Factory CTD Remote,Boostvalve,HV,PřehazovačkaShimano XT RD-M786 SGS ShadowPřesmykačShimano XT FD-M786ŘazeníShimano XT SL-M780BrzdyShimano Deore XT BR-M785, 203mm + Shimano Deore XT BR-M785, 180mmKlikyShimano Deore XT FC- M785,38-24KazetaShimano Deore XT CS-M771-10 11-36,10-speedŘetězShimano CN-HG75Zapletená kolaCitec M1800 Ascender Disc, QR15 + Citec M1800 Ascender Disc, X12PláštěSchwalbe Rock Razor/Ha..